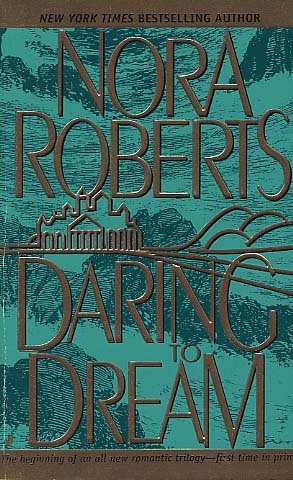 DARING TO DREAM by Nora Roberts is 278 pages long in the 3-in-1 Edition. It is #1 in The Dream Trilogy. This first book is about Margo and how she goes from having everything to staring over. Margo was very interesting and I liked her attitude the whole way through the book. She was not a loser by any means even though she lost everything, she was a fighter and came back up looking to make her life a success. All three sisters are discussed in this book and you do get a sense of who they are, so I am sure the other two books in the trilogy will be just as good. Kate is probably the one I don't like the most, but still she seems to be interesting and I can't wait to read her story. I think I can relate to Kate and her desire to see that all the i's are dotted and t's crossed. If you are looking for a fast, fun and interesting read, Nora Roberts always fills the bill for me. I had went to the flea market without my current book and didn't want to pick up a book that was in the middle of a series. This certainly held my attention and I wanted to keep reading it. My time for reading is rather limited at the moment as I have a lot of books to inventory and post on my website. So I only have stolen moments now and I savor them so much more. I am giving this 4 out of 5 stars. There were a couple of parts that I felt were rushed, but I still enjoyed the book and want to read the other two books in the trilogy. BUY NOW: Conniesbookshelf $4.99. This is the hardcover book with 3-in-1.